Hi friends! Gobi ka paratha, is an absolute winner of the most popular paratha in North India. 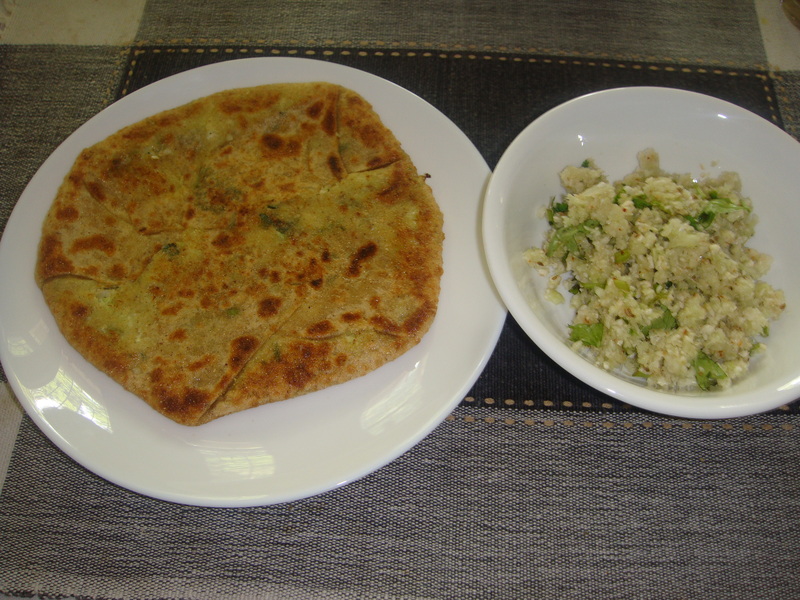 Theparathas are stuffed with spicy grated cauliflower. Take atta / whole wheat flour in a bowl mix water , little at a time. Add enough water to make a firm dough (not too soft not too hard). Keep aside, covered for ten to fifteen minutes. Wash and finely grate cauliflower in a bowl. Add finely chop coriander leaves , ginger, green chilies, cumin powder,carom seeds / ajwain and salt in to the grated cauliflower. Divide the dough in medium-sized balls, roll out each ball into a medium thick chapatti using dry flour for dusting. Place a spoonful of the cauliflower mixture in the center and bring the edges together to seal and form into a round shape once again. Press on your palm. Sprinkle a little flour on top, and roll the stuffed dough gently, taking care not to break it. Heat a tawa /griddle/ non-stick tawa, place the rolled paratha on the heated tawa. Shallow fry both sides on medium heat with little pure ghee/olive oil till both sides are evenly cooked and golden. Serve hot with a blob of butter. Note: A bowl of curd / yogurt and chili pickle/ fresh coriander chutney is a good accompaniment. Sulforaphane in cauliflower and other cruciferous vegetables has been found to significantly improve blood pressure and kidney function.Scientists believe sulforaphane’s benefits are related to improved DNA methylation, which is crucial for normal cellular function and proper gene expression, especially in the easily damaged inner lining of the arteries known as the endothelium. You need some level of inflammation in your body to stay healthy. Cauliflower contains a wealth of anti-inflammatory nutrients to help keep inflammation in check, including indole-3-carbinol or I3C, an anti-inflammatory compound that may operate at the genetic level to help prevent the inflammatory responses at its foundational level. Eating cauliflower regularly is a simple way to get these much-needed nutrients into your body. It’s also a good source of vitamin K, protein, thiamin, riboflavin, niacin, magnesium, phosphorus, fiber, vitamin B6, folate, pantothenic acid, potassium, and manganese. Cauliflower is a good source of choline, a B vitamin known for its role in brain development. Cauliflower helps your body’s ability to detoxify in multiple ways. It contains antioxidants that support Phase 1 detoxification along with sulfur-containing nutrients important for Phase 2 detox activities. The glucosinolates in cauliflower also activate detoxification enzymes. Eating cauliflower is like winning the antioxidant and phytonutrient lottery. It’s packed with vitamin C, beta-carotene, kaempferol, quercetin, rutin, cinnamic acid, and much more. Antioxidants are nature’s way of providing your cells with adequate defense against attack by reactive oxygen species (ROS). If you have a medical condition, Nick’s kitchen recommend that you consult your health care professionals before changing your diet.